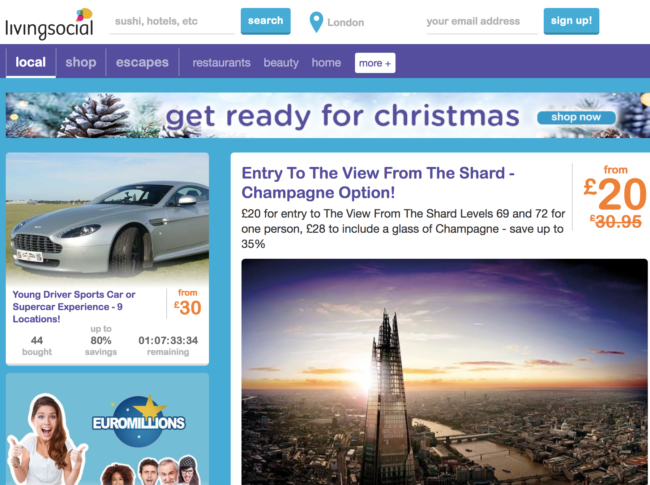 Livingsocial UK is a deals website offering discounts on a wide range of different events and activities throughout London and the rest of the UK. Just enter what you’re looking for in your local area and choose from an array of daily deals. With vouchers available for restaurants, events and activities, health and beauty and much more, it’s one of the most extensive deals websites out there. That is, however, once you’ve made an account – as there is no browsing without registration. Can purchase Gift cards for loved ones – 15, 25, 50, 100 Deal Bucks available. Check nearby deals section if you want to make a night of it! Livingsocial UK is designed for those looking to spice up their social life, whether that be with drinks, food, or entertainment. With a wide range of deals on offer all within your local area, the site is perfect for those looking so save a little when they go out, as well as on day to day purchases. However, be wary, customer service aren’t very helpful should things go wrong. Visit our London Vouchers section for more discounts and codes looking to save you money.